NASA's Spitzer Space Telescope was able to detect a super Earth's direct light for the first time using its sensitive heat-seeking infrared vision. While the planet is not habitable, the detection is a historic step toward the eventual search for signs of life on other planets. Super Earth's are more massive than Earth but lighter than gas giants like Neptune. 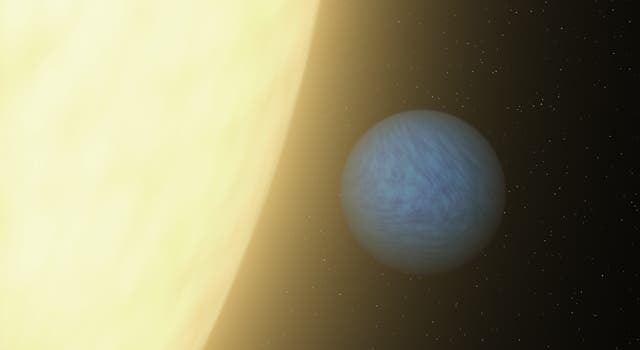 As the image above shows, in visible light, a planet is lost in the glare of its star (top view). When viewed in infrared, the planet becomes brighter relative to its star. This is largely due to the fact that the planet's scorching heat blazes with infrared light. Even on our own bodies emanate more infrared light than visible due to our heat. "The spacecraft is pioneering the study of atmospheres of distant planets and paving the way for NASA's upcoming James Webb Space Telescope to apply a similar technique on potentially habitable planets," said Bill Danchi, Spitzer program scientist at NASA Headquarters in Washington. "It could be very similar to Neptune, if you pulled Neptune in toward our sun and watched its atmosphere boil away," said Michaël Gillon of Université de Liège in Belgium, principal investigator of the research, which appears in the Astrophysical Journal. The lead author is Brice-Olivier Demory of the Massachusetts Institute of Technology.